The facilities were some of the best I had seen and Nottingham as a city seemed like there was lots going on. “The freedom - we weren’t pigeonholed to a specific discipline. The tutors allowed us to do just about anything! I now specialise in embroidery but a lot of my work involved digital print." Did the course include any guest speakers? “Almost every week we had a guest lecturers from the industry visit. Some of these were freelancers, researchers, MA students and others from the fashion industry – giving everyone the chance to listen to someone who was relevant to their interests." Why would you recommend studying Textile Design NTU? 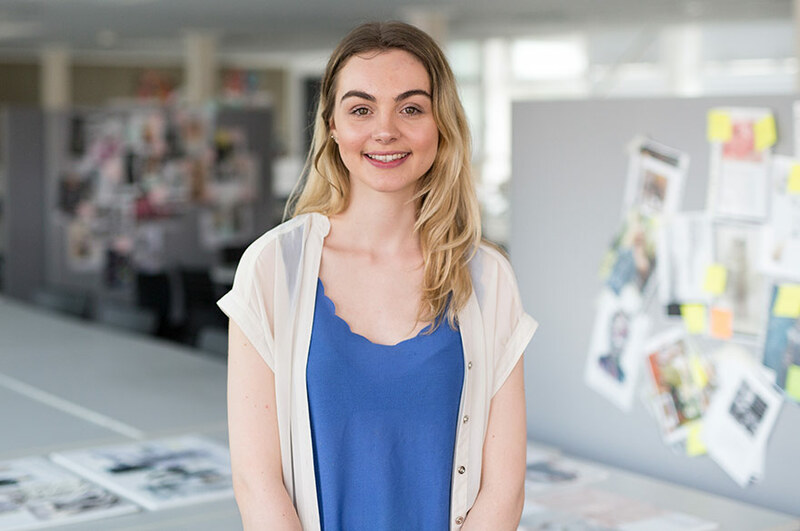 “Textile Design at NTU is a really well structured course with lots of opportunities and links within the industry. The tutors are so supportive and give you lots of freedom to grow and develop as a designer." You were awarded a year-long graduate internship working with ANN INC. in New York – can you tell us a little bit about this? “We had to design a collection of swatches for each ANN INC. brand, alongside some visualisations and concept boards. We had to have differentiation between each collection, making sure it suited their customer and had the right feel to it but also have some connection across all three. “Nine NTU students were shortlisted for an interview. Two members of the ANN INC. recruitment team came to NTU and interviewed us individually. Did you complete any other placements during your time at NTU? “In February 2016 I interned at Julien MacDonald during London Fashion Week, mostly running errands, beading and finishing garments. Before that, I interned with a fashion events company called Fashion Scout, again during London Fashion Week. I was able to see the production and management side of organising LFW. More recently, I interned at Michael Kors in New York for one month. This was an amazing opportunity and something which definitely helped me with the ANN INC. project."